Are the current RTOG Contouring Atlas definitions for supraclavicular lymph nodes adequate for all breast cancer patients? A 49-year-old gravida 3, para 2 premenopausal white female presented with subacute right mastalgia, erythema, and edema, plus palpable right axillary lymphadenopathy. Initial treatment with antibiotics provided no resolution. Further work-up, including bilateral diagnostic mammography and ultrasound, delineated diffuse skin thickening of the right breast and a 4-cm right axillary lymph node (new since screening mammogram 2 months prior). Ultrasound-guided core biopsy evinced infiltrating ductal carcinoma nuclear-grade 2(ER +, PR -, HER-2/Neu -) within the lymphovascular spaces. 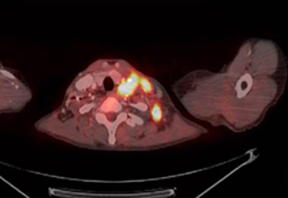 Breast magnetic resonance imaging (MRI) and positron emission tomography/computed tomography (PET/CT) scanning confirmed neither evidence of contralateral disease nor distant metastases, but showed hypermetabolic, enlarged supraclavicular lymphadenopathy (cT4dN3cM0, Stage IIIC). The patient completed 4 cycles of neoadjuvant adriamycin/cytoxan, followed by Taxotere and right modified-radical mastectomy, with complete pathologic response in the breast and 10axillary lymph nodes. She completed adjuvant chest wall and supraclavicular radiotherapy to a dose of 50.4 Gy in 25 fractions, followed by a10 Gy scar boost and a 5.4 Gy boost to the involved supraclavicular lymph node. The supraclavicular field was modified to incorporate the involved posterior-lateral supraclavicular lymph node (Figure 1). At last follow-up, there was no-evidence-of-disease at 8-months post-radiotherapy on adjuvant Tamoxifen without late complications. 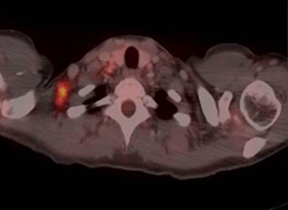 Prechemotherapy PET/CT scans showed a 1.6-cm right posterior-lateral supraclavicular lymph node with a maximum SUV of 5.9, with complete metabolic response on postneoadjuvant chemotherapy PET/CT (Figure 2). Clinical Stage IIIC (T4dN3cM0) inflammatory right breast cancer with complete metabolic and pathologic response to 4 cycles of neoadjuvant chemotherapy status following a right-modified radical mastectomy. 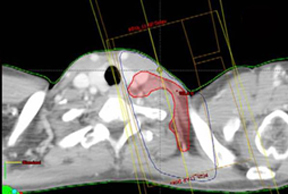 Numerous landmark randomized trials have established the importance of adjuvant locoregional radiotherapy in breast cancer, with a 1 in 4 reduction in breast cancer-specific survival for each locoregional recurrence prevented.1 Supraclavicular lymph-nodal irradiationis commonly incorporated into adjuvant radiotherapy, as supraclavicular failure accounts for 30% to 40% of locoregional recurrences following mastectomy and doxorubicin chemotherapy without radiotherapy.2 The emergence of CT-based planning and intensity-modulated radiation therapy (IMRT) has placed increased emphasis on accurate contouring of the clinical target volume (CTV) in lymph-node regions at risk for micro-metastases in adjuvant breast radiotherapy. Current guidelines, such as The RTOG Contouring Atlas, serve as invaluable tools for the radiation oncology community; however, continued reassessment of appropriate target definitions and individualized patient application is essential. 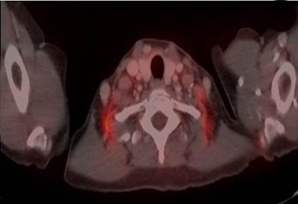 With the emergence of PET/CT, both in locally advanced and inflammatory breast cancer, we increasingly have noted disease in posterior/lateral SCLN fossa (low neck level V). 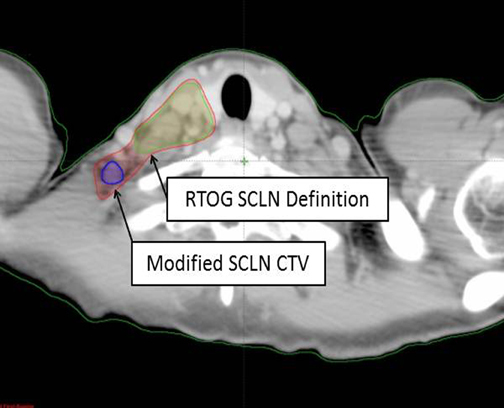 The presented IBC patient highlights one exemplary case (of at least 5 during a 3-year period) at our institution with SCLN extension into the lower neck nodes, which would not be included in the currently recommended RTOG contouring definitions (Figure 1). Others have reported similar concerns, where 15% of N3c patients had SCLN posterior to the transverse vertebral process,with level V representing 21% of the total SCLNs identified by PET/CT.7 Indiscriminate application of contouring guidelines without consideration for specific patient disease, anatomy, and risk could result in a geographic miss of posterior lateral SLCN, as seen Figure 3, where an infiltrating ductal carcinoma patient experienced isolated SCLN recurrence with posterior-lateral involvement. The current definitions recommended in The RTOG Contouring Atlas may inadequately represent the lower, adjacent level V neck nodes, especially in patients with gross medial SCLN involvement and inflammatory or locally-advanced breast cancer at high-risk for subclinical disease. Caution is advised when applying this definition of the SCLN CTV in such patients without patient-specific consideration of disease, anatomy, and risk. Particular attention is warranted when usingIMRT, where sharp dose gradients in the target area may increasingly omit at-risk nodal regions relative to 3D techniques.If available, pretreatment PET/CT should be focused carefully on identifying grossly involved posterior-lateral SCLN. Further research is warranted in defining patients who may benefit from including adjoining level V nodes. We recommend case-by-case consideration for individualized specification of medial-versus-lateral SCLN risk in applying current RTOG contouring guidelines to avoid geographic miss. Clarke M, Collins R, Darby S, et al. Effects of radiotherapy and of differences in the extent of surgery for early breast cancer on local recurrence and 15-year survival: An overview of the randomized trials. Lancet 2005;366:2087-2106. Katz, A, Strom EA, Buchholz TA, et al. Locoregional recurrence patterns after mastectomy and doxorubicin-based chemotherapy: Implications for postoperative radiotherapy. J Clin Oncol 2000;18:2817-2827. RTOG Breast Cancer Contouring Atlas. http://www.rtog.org/CoreLab/ContouringAtlases /BreastCancerAtlas.aspx. Accessed July 29, 2012. Lievens Y, Poortmans P, Van den Bogaert W. A glance on quality assurance in EORTC study 22922 evaluating techniques for internal mammary and medial supraclavicular lymph nodechain irradiation in breast cancer. Radiother Oncol. 2001;60:257-265. Olivotto IA, Chua B, Elliot EA, et al. A clinical trial of breast radiation therapy versus breast plus regional radiation therapy in early-stage breast cancer: The MA20 trial. Clin Breast Cancer. 2003;4:361-363. Strom EA, Woodward WA, Katz A, et al. Clinical investigation: Regional nodal failure patterns in breast cancer patients treated with mastectomy without radiotherapy. Int J of Radiat Oncol Biol Phys 2005;63:1508-1515. Reed VK, Cavalcanti JL, Strom EA, et al. Risk of subclinical micrometastatic disease in the supraclavicular nodal bed according to the anatomic distribution in patients with advanced breast cancer. Int J Radiat Oncol Biol Phys. 2008;71:435-440. Are the current RTOG Contouring Atlas definitions for supraclavicular lymph nodes adequate for all breast cancer patients?. Appl Rad Oncol. Prepared by Dr. Vargo and Dr. Beriwal while at the Magee Women’s Hospital of University of Pittsburgh Medical Center, Pittsburgh, PA.